Objective: To evaluate the concentration of N terminal proBNP (NT-proBNP) and partially the serum uric acid in the severe condition of aortic valve dysfunction for assessment of left ventricle hypertrophy. 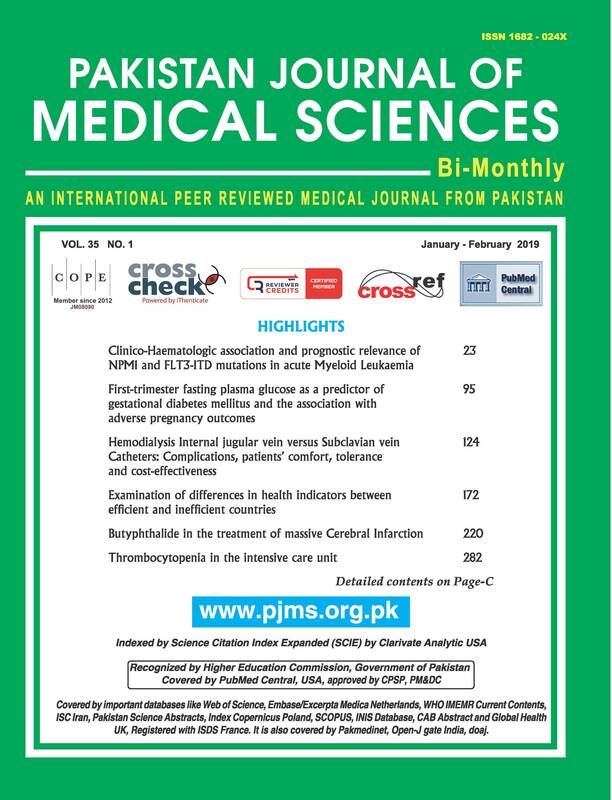 Methods: The study was conducted in the signal transduction lab department of biochemistry Quaid-I-Azam University, Islamabad from September 2013 to February 2017. NT-proBNP and serum uric acid were measured in one hundred patients of aortic valve dysfunction. The patients were divided into three main groups: 1) Aortic stenosis, 2) Aortic regurgitation, and 3) Aortic stenosis with Aortic regurgitation. The results were compared between disease and controls groups. Results: High level of plasma NT-proBNP was detected in all the three disease groups of aortic valve (stenosis, p<0.001), (regurgitation, p<0.001) and (stenosis with regurgitation, p<0.001). In addition, non-significantly increased level of serum uric acid was also observed in left ventricle hypertrophy in all the three respective disease groups of aortic valve. Conclusion: Increased secretion of NT-proBNP during cardiac remodeling can be related to the severity of left ventricle hypertrophy due to aortic valve abnormality in all the disease groups of severe stenosis, severe regurgitation, and combine disease condition of severe stenosis and severe regurgitation. However, non-significant increase in uric acid concentration is also identified which may be due to one of the factors involved in left ventricle hypertrophy in all the three disease groups of aortic valve. The interaction of uric acid with NT-proBNP during cardiac remolding due to aortic valve dysfunction is still not clear.